Lately I've been obsessed with Vanilla. Not just any vanilla, but real vanilla from vanilla beans. I think it all started when we made a creamy vanilla custard on Christmas Day for dessert. I couldn't stop licking the bowl. I could not stop. Yesterday, I made a Vanilla Cream Sauce with Meringue Clouds for a dessert feature I was working on for another blog for which I contribute (I'll share the photos and link shortly). There is something about cooked vanilla that sends me into a tizzy. With my new found obsession with all things vanilla, I thought I'd try some vanilla coffee K-Cups... after all, I love vanilla lattes. Nope. I should have known! The "French Vanilla" flavor was nothing like the warm flavor of real vanilla. Suddenly, I remembered an amazing vanilla bean syrup I put in my latte at Natasha's Mulberry & Mott in Kansas City (left : photo of her peppermint & orange syrup). So, this morning I made a batch of Vanilla Bean Simple Syrup to accompany morning coffee... it was everything I hoped it would be! Real, warm, slightly sweet vanilla. Ummmm. Scrape the beans from the vanilla bean. In a saucepan, mix together sugar, water and seeds from the vanilla bean. Cook on low heat until it simmers. Cook for 8-10 minutes until the liquid has reduced. Cooking in the saucepan with the bean seeds and the bean. Vanilla is amazing but peppermint is my obsession! Do you have a recipie for peppermint syrup? i'm making this right now - trying it with raw sugar. hoping i find in the morning that it's every bit as delicious as i'm anticipating! thanks for the fabulous idea! This syrup looks delicious! 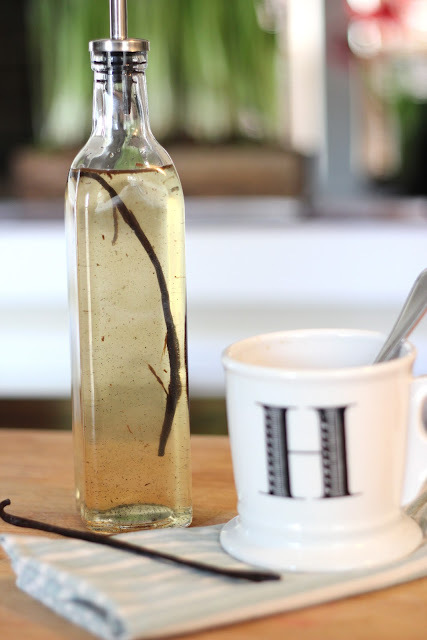 I need to use up my vanilla beans so this is definitely on my to do list...how do you suggest this to be stored and how long does it keep?